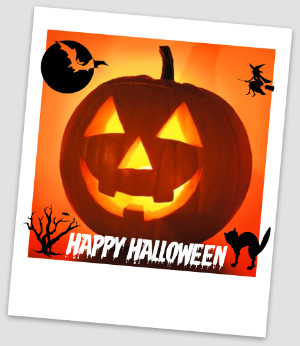 Basic Living - Blog: Getting Ready for Halloween!!! It's October! Halloween is coming! It's time for costumes, candy, and decorating!!! Oh, and don't forget the pumpkin carving either. It is a great way to spend quality time with your family and to nurture your creativity. Here at Basic Living, we gathered 15 yummy recipes for you to try this Halloween season. Be sure to start trying them early, so you can use your favorite ones to make your Halloween even yummier! Line a jack-o-lantern with aluminum foil and fill it with your favorite pop corn or pop corn balls. Fill a mixture of salted popped corn and candy corn in plastic bags, tie with curled ribbon and presto...great center piece or give away goodies. butter and salt. Cook over medium heat, stirring constantly until mixture comes to a boil. Attach candy thermometer to pan. Continue without stirring until mixture reaches 270 degrees or until a small amount dropped into very cold water separates into hard, but not brittle, threads. Remove from heat. Add vanilla and stir only enough to mix it through hot syrup. Pour syrup slowly over popped corn, mixing it with a fork. When cool enough to handle but still quite warm, form into balls or shape as desired. Preheat oven to 250 degrees. Place pop corn and nuts in a large, 4-inch-deep baking pan. Keep warm in oven. Lightly butter a cookie sheet. Melt butter over low heat. Blend in honey until well mixed. Remove pop corn mixture from oven. Set oven at 350 degrees. Pour butter-honey mixture over pop corn-nut mixture and mix well. Spread in think layer on cookie sheet. Bake 10 to 15 minutes or until crisp. When cool break or cut apart. Makes 3 1/4 quarts. in oven. Butter 2 8-inch square baking pans. Mix molasses, sugar, butter, vinegar and water. Cook slowly without stirring, until mixture reaches 250 degrees on a candy thermometer. Add baking soda and stir well. Remove from heat and quickly stir in vanilla. Remove pop corn from oven. Pour syrup mixture over pop corn and nuts and mix well. Press into buttered pans. Cut when cool. Makes 24 squares. saucepan, combine butter and honey. Cook over low heat until butter is melted. Pour over pop corn mixture, tossing lightly until well coated. Place in oven. Bake 30 minutes, stirring occasionally. Makes 3 quarts. Store in tightly covered container up to 2 weeks. stirring for 5 minutes. Remove from heat; stir in soda and vanilla. Gradually pour over popped corn, mixing well. Turn into 2 large, shallow baking pans. Bake at 250 degrees for 1 hour stirring every 15 minutes. Remove from oven, cool completely. Break apart and store in tightly-covered container. Makes about 5 quarts. to taste. Makes 2 quarts. Variations: Use chicken, onion or other flavored bouillon. thyme. Warm over low heat to melt the butter. Drizzle over pop corn. Mix well. Add salt to taste. Makes 2 quarts. In small saucepan, melt butter and peanut butter until smooth. Pour over popped corn and mix well. Put popped corn in lightly oiled bowl. Combine sugar, water and butter and bring to a boil, stirring. Boil until a few drops form a soft ball in cold water (230 degrees on a candy thermometer). Gradually pour syrup over pop corn and stir until every kernel is coated. Spread in shallow pans or on waxed paper to cool. Pop corn may be tinted by adding a few drips of food coloring to the syrup before pouring over the pop corn. well. Press firmly into buttered baking pan. Bake for 15 minutes. Cut into 2” x 2” bars and let cool. Makes 16 bars. 1/2 C. popped pop corn makes 1 C. medium ground pop corn. without stirring for 5 minutes. Remove from heat. Pour over popped corn, mixing well. Turn into 2 large, shallow baking or roasting pans. Bake at 250 degrees for 1 hour, stirring every 15 minutes. Remove from oven, cool, and break apart. NOTE: If pop corn balls are desired, do not place mixture in oven, but form into balls immediately. desired color and stir until evenly blended. Pour over pop corn and mix until well coated. Form into shapes. corn syrup. Cook stirring constantly, until mixture comes to a boil. Boil, without stirring, 5 minutes. Remove pan from heat. Add peppermint extract and green food coloring. Pour over pop corn in pan and stir to mix. Bakes in 250 degree oven 1 hour, stirring 3 or 4 times during baking. Cool completely. Makes about 2 1/2 quarts. 1/2 C. honey in granola. popped corn mixture. Toss to coat thoroughly. Spread on a lightly buttered 10 X 15-inch jelly roll pan. Bake at 275 degrees for 40 minutes stirring every 10 minutes. Cool to crisp. Store in air-tight containers. Makes about 4 1/2 quarts.